Enjoy the sublime combination of adventure, Indigenous culture, and awe-inspiring natural wonder. 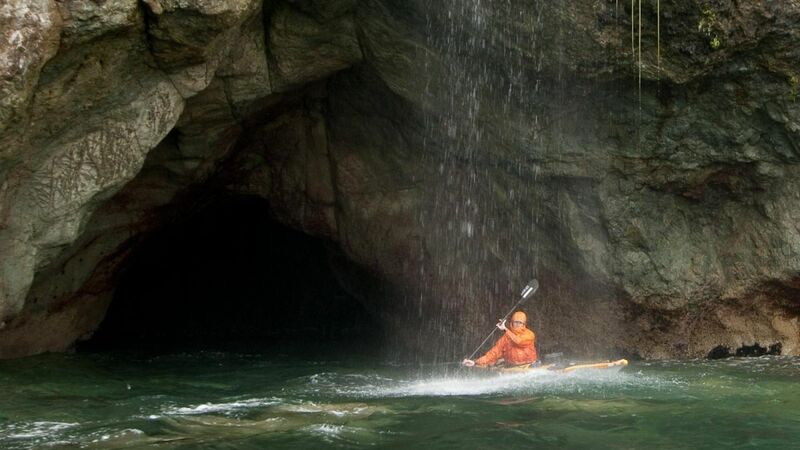 Perfect for intermediate kayakers interested in expedition travel. 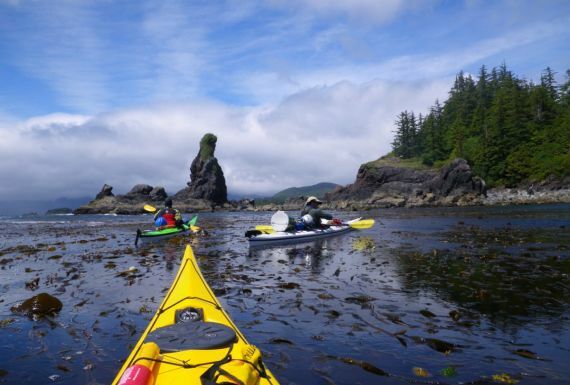 You'll traverse exposed and sheltered waters through the notable territory of the Che:k:tles7et'h' (Checleset) Indigenous people and experience the wild riches of the Checleset Bay Ecological Reserve that can include kayaking with whales and sea otters. 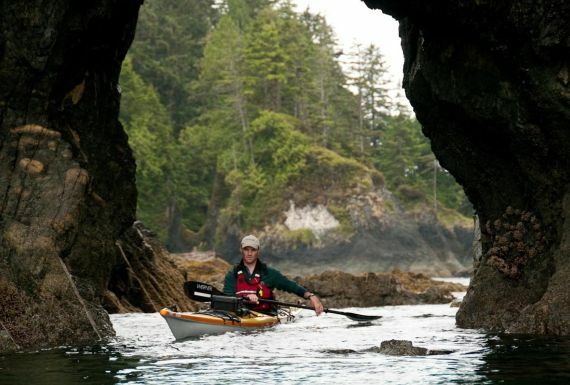 An exhilarating and satisfying sea kayaking 'trip of a lifetime' on Vancouver Island. These trips begin and end from your accommodation in Comox/Courtenay or Campbell River, include van transportation, a scenic boat ride to our Wilderness Retreat Base Camp, and the perfect mix of personal and group time once on the west coast. The fabled Bunsby Islands are on many sea kayakers' checklists as a place to repeatedly visit. 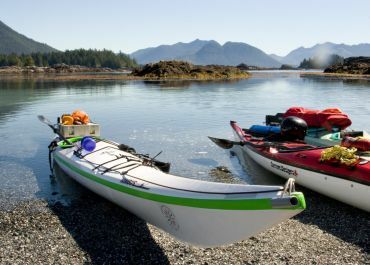 This educational kayaking tour has us travelling through the territory of the Che:k:tles7et'h' (Checleset) First Nation, and the largest marine ecological reserve in British Columbia, the expansive Checleset Bay Ecological Reserve. The combination of Indigenous cultural heritage and natural features provides rich opportunities to connect with coastal ecology. 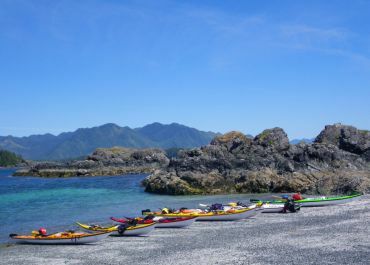 Depending on the mix of variables, this kayaking expedition often reaches as far as the Brooks Peninsula on a day or overnight trip from nearby Battle Bay or the Acous Peninsula. 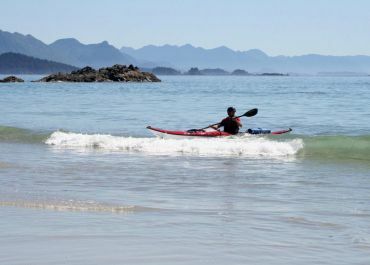 Though designed for "experienced paddlers" and campers who have done a reasonable amount of paddling and camping in a range of conditions, this kayaking expedition is slightly less strenuous and "committing" than our Destination Brooks Peninsula trip. 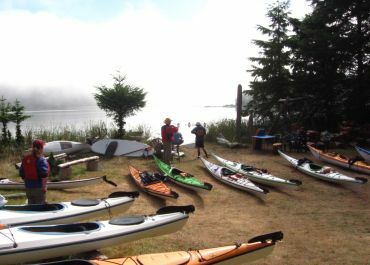 Participants should still know they will be comfortable and able to kayak for 3 to 5 hours each day, and prepared to be camping in a range of coastal weather. re-entry techniques (assisted and solo techniques for getting back into the kayak after a capsize!). All guests are required to have cold water immersion gear (wetsuit or drysuit) available for some sections of the open water paddling, possible surf landings, or if warranted by the sea or weather conditions (some wetsuits are available for rental from WCE - please arrange in advance). Though we require some previous experience, this expedition is about much more than the sea kayaking - kayaks are our quiet vehicles through this remote marine area steeped in natural and cultural history. 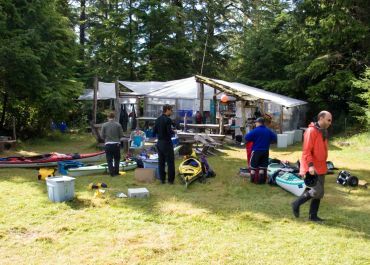 The start and end of your expedition uses our Wilderness Retreat base camp amenities on Spring Island as the perfect staging ground for this adventure "up west". 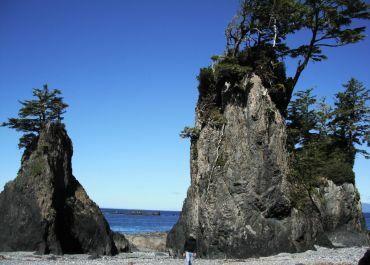 The specific itinerary of this "Bunsby Islands Kayaking" trip varies with the interests and skills of the group, the moods of the ocean and weather, and the offerings of this spectacularly rugged Vancouver Island coastline. Max group size of ONLY 8 guests unless a custom group booking. 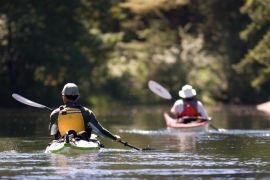 Experienced paddlers and west coast wilderness campers already have a pretty good idea about the personal clothing and camping equipment required. We take care of the rest! A detailed suggested packing list is included in your pre-trip information package provided upon registering. Diverse fleet of new, high-quality fibreglass and Kevlar single and double kayaks and all related kayaking equipment; though we do our best to accommodate requests for using a single or double kayak, there is almost always a minimum of one double kayak on an expedition, so depending on guest preferences, even if you "prefer" a single, you might rotate through time in the double - this is for group safety and everyone's benefit during expedition travel. On your first night, enjoy the comforts and conveniences of our Wilderness Retreat, including a delicious sleep in our waterfront tents with beds, pillows, fitted sheet, and fleece blanket (just need your sleeping bag...or arrange to rent one from us). This may also be where you spend your last night with us. 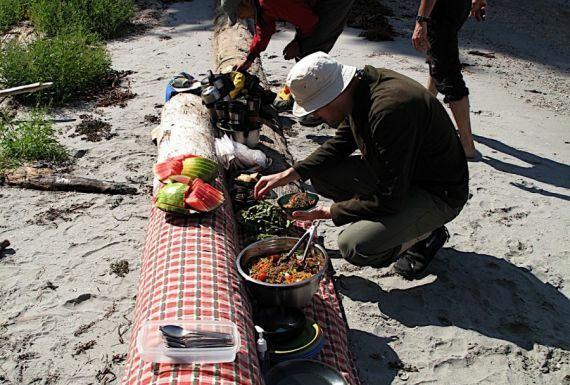 All scrumptious meals and snacks once with us in Kyuquot and on your expedition - everyone is pleasantly satiated! Innumerable other things - big & small - that make your experience with us feel comfy & complete! Please bring your own sleeping bag and tent, or arrange in advance to rent these from us. Early afternoon arrival and a light lunch; after a brief orientation to our base camp facilities (shower, resource library, outhouses, fresh drinking water, etc. ), the group will discuss our best options and suitable timing for packing and departing for the Bunsby Islands the next day. Time to settle into your waterfront tent accommodations for the first night in camp; once settled, we'll typically go for a relaxing afternoon paddle close to camp - getting active and further oriented. Alternatively we may jump into reviewing kayak packing and safety procedures, assign boats for the trip, and, if the weather is suitable to depart Spring Island the next morning, dive into getting all of the gear loaded! After dinner, if time permits, we will enjoy a sunset walk to the wild west side of Spring Island to get a view across Checleset Bay and toward the Brooks Peninsula - our marinescape for the week! The long day of travel and trip preparation, and the soothing sound of waves on the shore, should help you to sleep despite the excited anticipation of the adventure ahead! You might be woken by the caress of waves on the cobblestone beach, the morning mew of a sea otter pup in the bay, the call of a bald eagle overhead, or the simply the need to stumble out of the comforts of your tent, empty your bladder, and find a coffee to say hello to the day! After a satisfying breakfast, if the weather isn't appropriate for immediate travel over the exposed traverse to the Bunsby Islands, we can spend an extra night initially exploring closer to Spring Island and using the base camp. This can be a great opportunity to see even more of the area. Otherwise, let's get going! Our guides will ensure that everyone is fully introduced to the kayaks and equipment, and related safety considerations for our travels. Enroute through Checleset Bay toward the Bunsby Islands and Acous Peninsula, if the weather and sea gods are smiling on us, we'll paddle into a sea cave and maybe even under a waterfall. We are also likely to witness Black Bears foraging for food along the steep rocky shore! By the time we reach our first campsite, we will have travelled approximately 7-8 nautical miles (about 13-15 km). 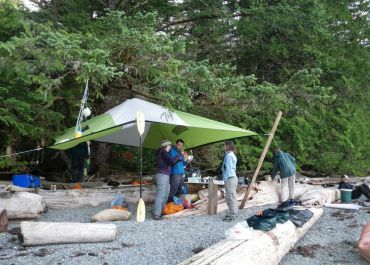 Weather permitting, and depending on where we camped the night before, we will likely proceed closer to the Acous Peninsula to allow for a possible day outing to Columbia Cove or Surfer Beach at Jackobson Point on the Brooks Peninsula. A day visit to the Brooks could include time for forest walk, beach combing, body surfing, and creek exploration up to a secluded waterfall and pool. On the water, we are likely to encounter Tufted Puffins, Stellar Sea Lions, Sea Otters, and possibly even a Harbour Porpoise, Humpback Whale, or Minke Whale. Nearby day-paddling options allow us to visit, with permission, the fallen totems in the long-abandoned Che:k:tles7et'h' (Checleset) First Nation village site at the Acous Peninsula, Battle Bay (and River), and an old Che:k:tles7et'h' (Checleset) defensive site currently inhabited by long-time friend, elder, and master weaver, Lucy Paivio. The Bunsby Islands have many idyllic shell beaches, and inviting passages cloaked in marine life. We generally camp in 2 or 3 different locations during the expedition. If the weather permits, we may choose to stay an extra night in the Bunsbies before returning to Spring Island on the morning of day 7. 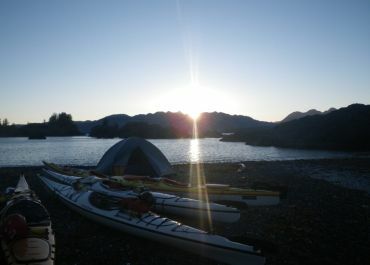 Otherwise, after an early rise and pack-up, we again traverse Checleset Bay back to Spring Island for the last night. Once back at our Base Camp and unpacked from the expedition, you may find the lure of the propane heated waterfront shower to be, well, irresistible! At Spring Island, there are again a variety of options group and personal activities depending on available time, interests, weather, and energy. It may be best to simply relax and reflect, fully absorbing the last part of this west coast expedition. After breakfast, if we arrived back on Spring Island on Day 6, we recommend exploring the nearby waters around Spring Island, or starting the day with an adventurous beach and forest walk that circumnavigates the island. During your morning paddle or walk, you can enjoy the views and memories of where you've just traveled. Otherwise, it's a morning of early packing, spectacular morning paddling across Checleset Bay waters, then preparing for departure from Spring Island. 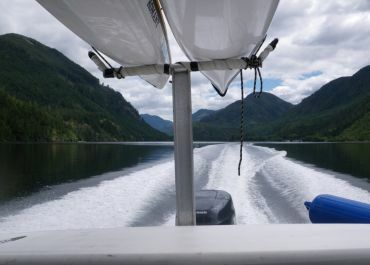 After lunch and goodbyes to Spring Island, the water taxi transportation to Fair Harbour will meet our van shuttle back to your accommodation or connecting travel in the Campbell River or Comox/Courtenay areas.